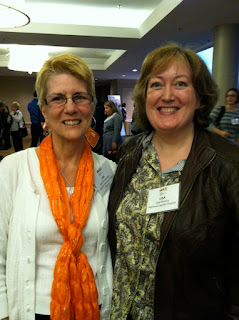 Sunday, I had the pleasure of meeting with two MS blogger friends in Denver for breakfast. Pictured below are Sherry from Word Salads, myself (Lisa) from Brass and Ivory, and Nadja from Living! With MS.
Sherry, Lisa, and Nadja. Breakfast in Denver. August 2012. Since beginning Brass and Ivory five years ago in August 2007 and the Carnival of MS Bloggers in January 2008, I have had the distinct privilege of meeting some absolutely wonderful people living with MS.
Joan, Lisa, and Jen. Lunch in Delaware. April 2010. Diane, Webster, Rob, Lisa, Jen, Gretchen, Jen's Mom. Coffee in Seattle. June 2010. Lisa and Cathy. MS Cruise to Alaska. June 2010. Jen and Lisa. Weekend in New Jersey. October 2010. Lisa speaking at ePatient Connections Conference. Philadelphia. September 2010. 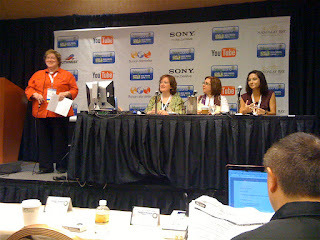 Patient Leader Panel at BlogWorld Expo. Las Vegas. October 2010. 2010 was a big year for meeting bloggers and speaking at conferences. Unfortunately, I didn't get pictures of some of the meetings with MSers I attended in 2011. Lisa, Jen, Cathy, Daria. Lunch in New Jersey. August 2011. Kelly (RA Warrior), Lisa, ePatient Dave. Philadelphia. September 2011. 2012 has been very busy - from blogging at the NMSS Public Policy Conference to traveling to Zurich to represent international MS patients. Lee and Lisa. National MS Society Public Policy Conference, Washington, D.C. March 2012.
International MS Patient Summit: Living and Working with MS. Zurich, Switzerland. May 2012. Jennifer, Lisa, and Ann. The Walking Gallery. Washington, D.C. June 2012. Michael and Lisa. Coffee in Washington, D.C. June 2012. Thank you so much for opening your homes and hearts throughout the past five years. I am so grateful to be a part of this MS community and to have so many wonderful MS friends. I wonder what will be in store for 2013. This concludes the 121st edition of the Carnival. The next Carnival of MS Bloggers will be hosted here on August 30, 2012. Please remember to submit a post (via email) from your blog of which you are particularly proud, or which you simply want to share, by noon on Tuesday, August 28, 2012. Thanks, Beverly! I never imagined that blogging would become what it is to me now. So much a part of my life and the number of friends I've made is amazing. 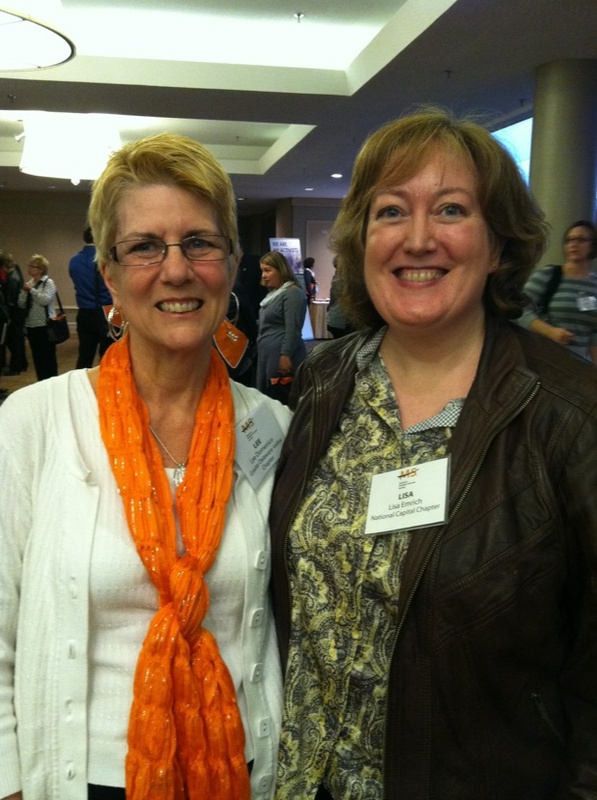 It is wonderful seeing how your blog and advocacy work has connected you to others. I am very curious what you think of http://now.tufts.edu/articles/healing-words and if there are differences between MS bloggers and people with other illnesses. I'll go check out the post. I have noticed slight differences between communities focusing on various chronic illnesses. But the bottom line seems to be the same. Connection, expression, and support which are often not available elsewhere. Did you see our new tshirt? It Reads "I am SO blogging about this"
It was also great meeting you on the cruise. I still wear my "shot" t-shirt even though I no longer "do shot." LOL. The "I am SO blogging about this" sounds like a wonderful addition to the collection. Lisa, you have the biggest smile I've ever seen! You radiate!